A Japanese bee separated and it gathered in the nearby tree. This Japanese bee was captured and it put it in the box in the nest. It would be greatly appreciated when becoming reference of the capture of the bee. A Japanese bee that had kept it since last year divided. 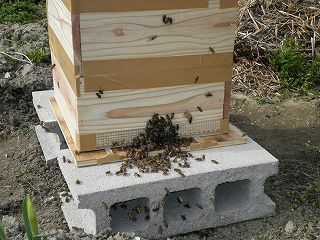 The Japanese bee that the vicinity had kept since last year around 3:00PM, April 10, 2011 is divided. Because honey was never squeezed last year, cannot the number of bees able not to have decreased so much in winter. I think that it is a bee to the extent that unexpectedly early. Generally, amount of bee gathers in the tree etc. near the bee house (nest box) for several hours - two days and makes bees-ball. It searches for the place where the scout bee becomes new those who live between those. When a suitable place is found, it moves all together for the place. To capture a Japanese bee, this bees-ball is put in the bee house (nest box). Putting the bee house that is called a waiting box to be near is effective of capture. There was a infomation of bee's dividing report, and the Japanese bee that the vicinity had kept went and captured it together around 3:00PM. 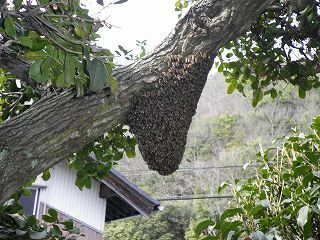 This photograph is a crowd of amount of bee in the tree near the bee house. Cotton work gloves was worn putting up the side cloth to the straw bonnet and it captured it to the net for the insect removing. It threw in on to the bee house of just making at once, and the lid was done. A Japanese bee never stings it on the belly if there is no great thing at amount of bee and that time after making honey full. Please note that it might be piercing because it doesn't have a large amount of honeys in the belly if it is in a bad mood when usually living in the bee house. The bee of the remainder enters the bee house that puts bee to the extent that it captures it. The bee house was set up in a suitable place. After bees-ball had been taken, bees-ball was able to be done because the place where bees-ball was able to be done and the place where the bee house had been set up were a little away. The bee that was not able to capture it was captured again with the net for the insect removing, and it released it in the vicinity of the front side of the bee house. Then, bees entered the box with the queen bee all together. Handmade wedge of 4mm made from the rule and the acrylic fiber of 30cm in length enabled the queen bee to go out to the entrance of the bee house. The width of 4mm is width that the worker bee can finally pass. Because the entrance was narrow, it took ten minutes or more and bees entered the bee house. There is a method to capture by using Kinryouhen-Cymbidium and the capture board, too. The bee is kept and the place where bees-ball can be done is decided roughly. It seems to be easy to capture it when the board that the surface is rough as bees-ball is made easily near there is set up making it beforehand. I also set it up making it. Moreover, the probability that can be captured goes up greatly when the bee house that is called a waiting tub (It is said the waiting box and the waiting cave) soon to be near is put, and the flower of the orchis named Kinryouhen-Cymbidium is put near the bee house. The person who doesn't exist in the house in daytime can capture the bee to this method. Moreover, it is the difficult one to match time when the flower of Kinryouhen-Cymbidium blooms at time when the bee divides.